The gold miners’ stocks have suffered a lackluster year so far, mostly lagging gold’s solid new upleg. But that vexing underperformance should soon give way to a big catch-up surge. The deeply-out-of-favor gold stocks are now entering their strong season, which starts right about now with a powerful autumn rally. That generates major gains on average in bull-market years, and this year’s upside potential is exceptional. Gold stocks exhibit strong seasonality because their price action mirrors that of their dominant primary driver, gold. Gold’s seasonality isn’t driven by supply fluctuations like grown commodities experience, as its mined supply remains fairly steady year-round. Instead gold’s major seasonality is demand-driven, with global investment demand varying dramatically depending on the time within the calendar year. This gold seasonality is fueled by well-known income-cycle and cultural drivers of outsized gold demand from around the world. Starting now in late summer, Asian farmers begin to reap their harvests. As they figure out how much surplus income was generated from all their hard work during the growing season, they wisely plow some of their savings into gold. Asian harvest is followed by India’s famous wedding season. In early 2013 the Fed’s wildly-unprecedented open-ended QE3 campaign ramped to full speed, radically distorting the markets. Stock markets levitated on the Fed’s implied backstopping, slaughtering demand for alternative investments led by gold. In Q2’13 alone, gold plummeted by 22.8% which proved its worst quarter in an astounding 93 years! Gold’s bear continued until the Fed’s initial rate hike of this cycle in late 2015. This chart averages the individually-indexed full-year gold performances in those bull-market years from 2001 to 2012 and 2016. 2017 isn’t included in this analysis yet since it remains a work in progress. This chart distills out gold’s bull-market seasonal tendencies in like percentage terms. They reveal right about now is when gold’s long parade of big seasonal rallies gets underway, kicking off with its major autumn rally. Remember this whole concept of seasonality relies on blending many years together, smoothing away outliers to reveal the core underlying tendencies. 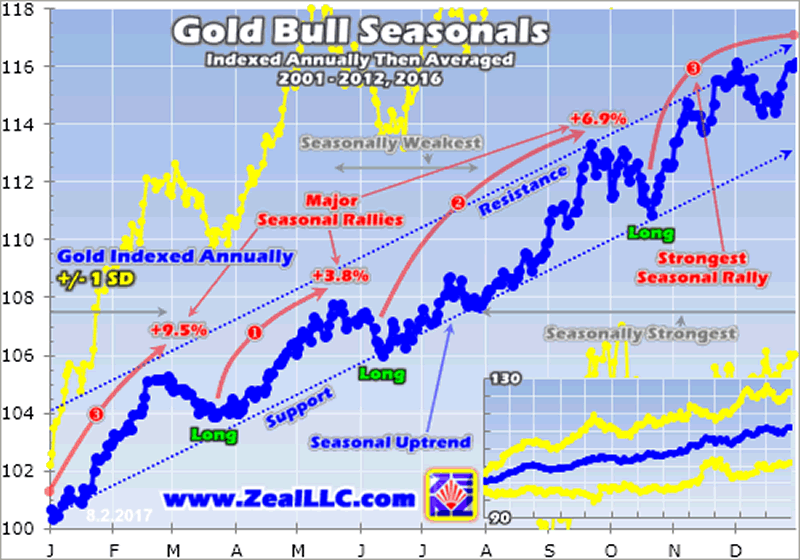 Seasonally gold tends to bottom in mid-June, but then still largely drifts sideways in its summer doldrums until late July. This year’s gold summer-doldrums low came a bit later in early July. At $1212, gold was still up 5.4% year-to-date compared to that low’s +6.0% average. From that major seasonal low in gold’s weakest time of the year, gold grinds higher in July before starting to surge again in August. That’s when Asian harvest buying kicks into full swing. Although August is still emerging from the summer-doldrums sideways grind, it’s actually gold’s fifth best month seasonally with a 2.0% average gain in these modern bull-market years. Investors and speculators need to be long gold in August! And gold’s major autumn rally only builds from there. Next comes September, which was actually gold’s strongest month of the year seasonally on average from 2001 to 2012 and 2016! Its 3.1% seasonal gain is challenged only by November and January, which weigh in at a slightly-lower 3.1% due to rounding and 2.9%. Overall gold’s autumn rally between mid-June and late September sees it power 6.9% higher on average. That’s a major gain by any standard in just 3.4 months. The historical average annual US stock-market returns run around 7% to 10% depending on the span measured. So seeing gold surge nearly that much on average in modern bull-market years in just over a quarter of the time is impressive. And gold’s already-underway autumn rally this year has much greater upside potential than usual due to a couple factors. Two key groups of traders drive gold’s short-term fortunes, gold-futures speculators and stock investors who buy that leading GLD gold ETF’s shares for portfolio gold exposure. They’ve both been exceedingly bearish this summer, and thus have dumped vast quantities of gold. So speculators and investors alike have massive mean-reversion buying to do to return their gold exposure to some semblance of normalcy. On the gold-futures side, speculators spent much of July aggressively dumping gold. That was mostly in the form of a near-record gold-futures shorting blitz! That left these traders’ collective short positions way up at near-record extremes. These extreme shorts are guaranteed near-future buying, because they soon have to be covered by buying offsetting long contracts. Short covering quickly snowballs, becoming self-feeding. That epic shorting blasted gold under both its 200-day moving average and upleg’s uptrend support back in early July. That spooked investors who were already enamored with the red-hot stock markets. So they jettisoned GLD shares far faster than gold itself was being sold, bashing this behemoth’s holdings to new post-election lows. With their gold holdings via GLD now very low, their portfolios can’t be properly diversified. Just this week, GLD held 791.9 metric tons of gold in trust for its shareholders. This was worth $32.2b at this week’s prevailing gold price of $1266. Meanwhile the collective market capitalization of the elite S&P 500 stocks is way up at $22,601.6b! That implies American stock investors, institutions and individuals combined, have gold portfolio allocations around 0.14%. Between 2009 to 2012, this ratio averaged 0.48%. The trigger necessary to rekindle gold investment demand will likely again prove a major stock-market selloff. Gold is a unique asset that tends to move counter to stock markets, an anti-stock trade. And that makes gold the ultimate portfolio diversifier, with investment demand surging as stock markets weaken. Gold has long been hostage to stocks. Its current bull was born in late 2015 in the midst of the last stock corrections. And make no mistake, despite the epic euphoria and complacency out there today’s stock markets face serious downside risks in coming months. That’s right during gold’s autumn rally. Big bearish factors that could spark another correction-grade selloff over 10% very soon include bubble valuations, record-low volatility, a toppy and tired long-in-the-tooth bull, and most importantly the Fed’s quantitative tightening. Especially since early 2013, this enormous stock bull has been artificially boosted by extreme Fed easing in the form of QE bond buying. Now the Fed is planning to reverse that into QT bond selling, likely to be announced in mid-September and started as Q4 dawns. The Fed plans to gradually ramp QT to high levels by late 2018, destroying vast amounts of capital created by QE and injected into the stock markets. This imminent Fed QT is super-bearish for these QE-levitated stock markets! And as they inevitably start rolling over, gold is going to catch a major bid again just like in early 2016. Stock investors will flood back into GLD shares to attempt to better diversify their stock-heavy portfolios. This year’s gold autumn rally will be supercharged if any of that mean-reversion investment buying happens within its coming-months timespan. Gold’s strong autumn seasonals are why gold stocks enjoy strong autumn seasonals of their own. Gold stocks amplify gold’s price action because gold-mining profitability leverages it. This next chart uses the same bull-market seasonal methodology applied to the flagship HUI gold-stock index. The gold stocks are now entering their best couple-month span of the year seasonally, a very bullish portent for this sector! While 13 bull-market years are indexed and averaged in this chart, last year’s outsized gold-stock action still really influenced these seasonals. As measured by that benchmark HUI, gold stocks blasted 182.2% higher in just 6.5 months between mid-January and early August 2016! Later the post-election gold exodus on stock-market Trumphoria helped drive a massive 42.5% HUI drop by that brutal mid-December bottom. So this entire gold-stock-bull seasonal chart shifted higher by about 5 indexed points compared to last year’s version before 2016! The gold stocks tend to bottom with gold seasonally, in mid-June. But that’s followed by a secondary low only slightly higher in late July. So on average, right about now is the best time of the year seasonally to throw heavily long gold stocks near their typical summer-doldrums bottoming. 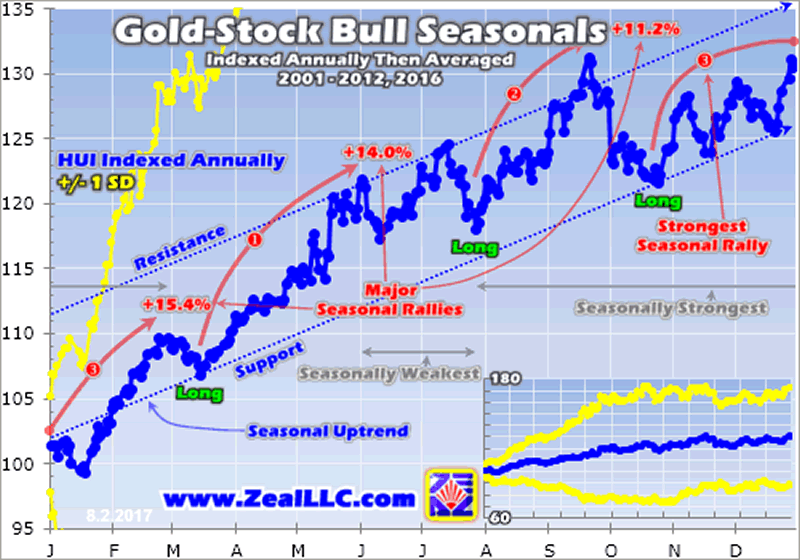 And this year’s gold-stock upside potential in their coming autumn, winter, and spring seasonal rallies is far greater than normal. Gold is a key factor, as the big mean-reversion buying coming in gold futures and GLD shares will catapult gold much higher. That will radically improve gold-stock sentiment, which is a bearish wasteland now. Gold-mining fundamentals will get much better too as their profits amplify gold’s gains. But the likely gold-stock gains in this new strong season running from now until next spring will really be compounded by this sector’s terrible performance this year. Normally at its mid-June and late-July summer-doldrums lows, the HUI is still up 17.3% and 18.1% year-to-date. But at its early-July low this year, the HUI was down 1.9% YTD! That was a ludicrous anomaly since gold was still up 5.4% YTD at that point. The major gold stocks generally leverage gold’s gains by 2x to 3x, which is why traders want to own them during gold bulls. With gold stocks now running sub-1x leverage to gold for most of 2017, they are due for a mighty catch-up surge back up to 2x+ in the coming months. At this week’s gold levels, the HUI would need to trade near 219 to run 2x leverage YTD and 238 for 3x. That’s 12% and 22% higher from here! Gold stocks are a small contrarian sector that is pathologically manic-depressive. They are often hated or ignored, and thus grind listlessly at relatively-low levels building bearishness. But that bipolar nature can shift on a dime once gold itself starts rallying convincingly. Then capital floods back into gold stocks and catapults them sharply higher within weeks. These surges following long drifts are wildly profitable to ride. But the only way to catch them is to buy low before they erupt, when gold-stock sentiment remains mired in excessive bearishness. That’s already reversing. Since early July’s summer-doldrums low this year, the HUI has already surged 10.3% as of this week. That leveraged gold’s 4.7% rally over that same span by 2.2x, right on target. Thus gold-stock sentiment has already begun improving in this sector’s young autumn rally. 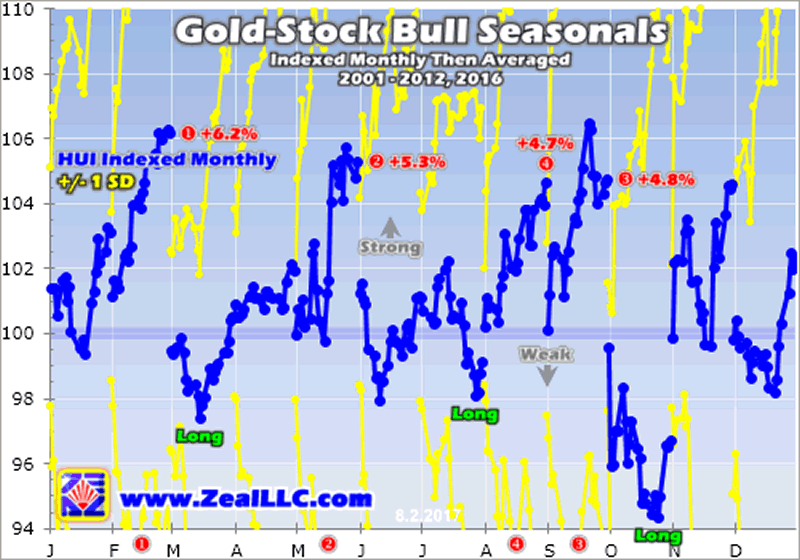 During these modern bull-market years from 2001 to 2012 and 2016, August and September were gold stocks’ fourth- and third-best months of the year seasonally! August averaged HUI gains of 4.7%, while September’s were even slightly better at 4.8%. While February and May are bigger, gold stocks have no other two-month span like August-September that averages such major back-to-back gains for this sector! After gold stocks have already started powering higher in their coming big autumn rally, the easy gains have already been won. While there are outliers, the average of 13 years of bull-market gold-stock price action decisively proves that the late summer doldrums are the highest-probability-for-success buying opportunity of the entire year! Contrarians strong enough to fight the herd can back up the truck for great bargains. So seasonal rallies are strongest when gold stocks have sentimental, technical, and fundamental reasons to power higher. That’s certainly the case this year! Bearishness in this sector is extreme after that terrible first-half performance, implying the sentiment pendulum is overdue to once again swing back to bullish. And after lagging gold so dramatically, gold-stock prices are likely to mean revert far higher to regain normalcy. And relative to gold which drives their profits and thus ultimately stock prices, the gold miners’ stocks are exceedingly undervalued today. They have rarely been cheaper fundamentally! This will become more apparent as the gold miners finish reporting their Q2’17 results in the coming weeks. The average gold price climbed 3.1% from Q1 to $1258 in Q2, which should boost this sector’s profits from already-strong Q1. At Zeal we’ve literally spent tens of thousands of hours researching individual gold stocks and markets, so we can better decide what to trade and when. As of the end of Q2, this has resulted in 951 stock trades recommended in real-time to our newsletter subscribers since 2001. Fighting the crowd to buy low and sell high is very profitable, as all these trades averaged stellar annualized realized gains of +21.2%! The key to this success is staying informed and being contrarian. That means buying low when others are scared, like late in gold stocks’ summer doldrums. An easy way to keep abreast is through our acclaimed weekly and monthly newsletters. They draw on our vast experience, knowledge, wisdom, and ongoing research to explain what’s going on in the markets, why, and how to trade them with specific stocks. For only $10 per issue, you can learn to think, trade, and thrive like contrarians. Subscribe today, and get deployed in the great gold and silver stocks in our full trading books! The bottom line is gold-stock seasonals argue this sector is right on the verge of a major autumn rally. August and September are the best couple-month span of the year for gold stocks seasonally in bull-market years. This is driven by a parallel autumn gold rally fueled by outsized Asian demand coming back online. Gold stocks naturally amplify gold’s gains since their profits leverage gold’s price moves. And since gold stocks have so seriously lagged gold in 2017, their upside potential in this year’s autumn rally is exceptional. Instead of just amplifying gold’s own coming gains like usual, the gold stocks need to stage a serious catch-up rally as well. That’s already begun in the past month, proving sentiment is starting to shift away from excessive bearishness. Momentum is building for a far-better-than-average strong season.